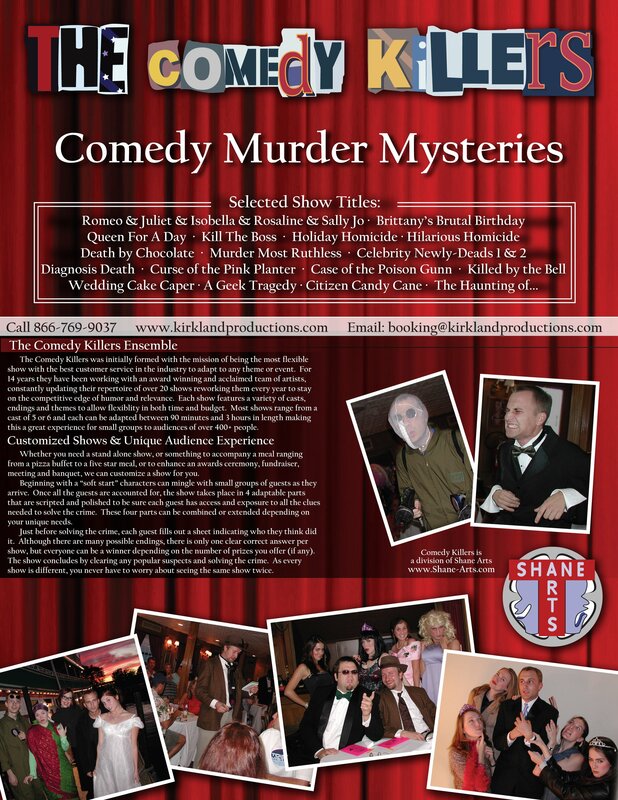 The Comedy Killers was initially formed fourteen years ago with the mission of being the most flexible show with the best customer service in the industry to adapt to any theme or event. Working with an award winning and acclaimed team of artists and actors, the group constantly updates their repertoire of over 20 shows reworking them every year to stay on the competitive edge of humor and relevance. Each show features a variety of different casts, endings, and themes to allow flexibility in both time and budget. Most shows range from a cast of five to six and each can be adapted to be between 90 mins and 3 hours in length making this a great experience for small groups to audiences of over 400 people. Whether you need a stand alone show, or something to accompany a meal ranging from a pizza buffet to a five star meal, or a little something for an awards ceremony, fundraiser, meeting and banquet, we can customize a show for you. Beginning with a “soft start” characters mingle with small groups of guests as they arrive. Once all the guests are accounted for, the show takes place in four adaptable parts that are scripted and polished to be sure each and every guest has access and exposure to all the clues needed to solve the crime. These four parts can be combined or extended depending on your unique needs. 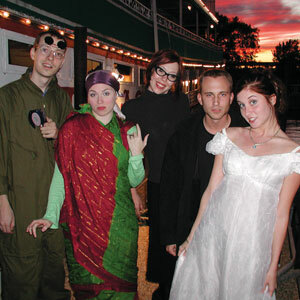 Just before the solving of the crime, each guest fills out a sheet indicating who they think did it. Although there are many possible endings, there is only one clear correct answer per show, but everyone can be a winner depending on the number of prizes you would like to give away (if any). The show concludes by clearing any popular suspects and solving the crime. As every show is different, you never have to worry about seeing the same show twice. Pop Star Brittany Simpson is one of the busiest brides in the entertainment industry, working on her third marriage in the last year. Hoping to break her last record of 28 hours to her new husband-to-be, Richard Ratzi, head of the Vigilante Record Franchise. She invites you to her wedding, and if she did not invite you, her maid of honor, Miss Cindy Rellah surely will. You will not want to miss the star-studded event. Complete with Brittany's talent coach, agent and mom, Amy as well as Richard's best man Giles E. McGee, Jr. RSVP's are already in from Christina Knowles, Pappa Ratzi, Justin Timetofallinthelake and Brittany's famous Aunt and Uncle. All these celebrities in one place is sure to be a killer wedding you will not want to miss. This is a great show for the entire family and was nominated for numerous theatrical awards during it's 2003 premiere. Each year, the script is re-worked with the latest in pop culture to include the most recent celebrity escapades. Our second sequel building on the success of our previous wedding themed murder mysteries and our original Celebrity Newly-Deads that was set about the romances and exploits of the pop music divas. This all new version requires no previous knowledge of its prequel, but sets the hilarity on the Hollywood scene. Mega Movie Stars Tom(Brat) Schmooze and Angie Holie would like to invite you to their latest wedding. Please join the "happy" couple in the company of A-List, B-List and sometimes Y & W list celebrities, jealous exes, and adopted families. Standing up with them is best man "George Looney" and maid of honor and Tom's adopted sister "Cindy". Sam Diamond is asked to officiate the ceremony. Help them celebrate their vows to love each other until DEATH do they part with their killer ceremony. Please RSVP ASAP. This show is suitable for all audiences. ...is 100% customized to a local urban legend or supernatural phenomenon (documented or completely fabricated). Our finest investigative team is brought in to investigate: Mrs. Claire Voyant, television celebrity pseudo-psychic (psycho) is on the scene along with her competition, Bernie Hudson, the “other” ghost terminator and paranormal investigator. The investigative reporter Edna “Eddy” It is also braving the circumstances to get the scoop for XYZ news. Horror film icons Jason Freddy Michaels (or) Christine Carrie Michaels arrive to do character research for the latest Vincent Craven film. Of course, the world famous highly-skilled private detective Sam Diamond is dispatched from Her Majesty’s Secret Service to be sure everything is on the up-and-up. However, when a damsel in distress shows up and goes mysteriously missing, only you can help Sam Diamond determine if she has been the witness to some strange phenomenon or simply the victim of foul play. Would you dare live out the "American Dream" and kill your boss? You might if your boss was the famous Kathie Dee Killford, the boss everybody loves to hate. She has gathered everyone for an important presentation, but someone in the company has a different business plan. See if you can help Sam Diamond discover who has given a new meaning to the term "hostile takeover". Could it be Debbie Dunitall, the temporary personal assistant who would do anything to go full-time? Edna "Eddy" It, the undercover investigative reporter who needs a scandalous news story to save her job? Archibald S. Shyster, who is suing the company in a personal (feeling) injury lawsuit case? Or Vinnie Bob Deniro, the special delivery messenger -- or is he really the legendary singing hitman? This show is extremely popular as it can be customized completely around your function. It is possible to put someone within your organization in the role of Kathie Dee Killford. This is our longest running, most successful show. Re-written and re-vamped every year to stay current, this show is fun for all ages. Mr. Romeo Verrafeely has invited local citizens and visiting royalty to dinner in order to make an important announcement. Unfortunately, Romeo bragged about his business meeting to his numerous romantic conquests of the last few weeks, and all four of them crash his dinner party—including Miss Juliet Iwannitall from Paris, The Princess Isobella Maria Sarafina Itsenougha Smith from Italy, Rosaline Alimony from London and Sally Jo Hick all the way from Arkansas. Once Romeo's schemes are exposed and his "conquests" discover each other, everyone is mad. One person decides to get even. It's up to Sam Diamond, the world-famous, highly-skilled, private detective to figure out who it is. We LOVED the event! I sense this becoming an event we do annually! Want to talk with us about The Comedy Killers?